A playful, fruity floral fragrance. Top notes include juicy pineapple and muguet with heart note of jasmine, followed by lilac, honeysuckle, and hyacinth. Strong hints of coconut with a light base note of Chypre complete this springtime fragrance. 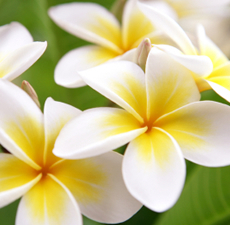 Plumeria, or Frangipani, is a small tree native to Caribbean, Central America, & Mexico. Very beautiful, fast and easy growing, it has spread to all the warm areas of the world, and it feels like it was always a part of its gardens and folklores. Plumeria is very often associated with exotic tropical islands (Hawaii, Tahiti) and their tradition of making leis to mark the important events such as birthing and dying, love and marriage, social, political, religious, and many other occasions. Plumeria, a newcomer to the old tradition, became the most popular flower for lei making, at least among the tourists.